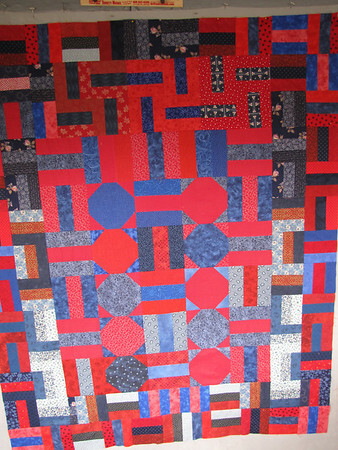 The red and blue quilt is now sewn together; 46 by 59. I had to add some to the railroad strips–some of the sewers were not accurate and rather than cut them all down, I opted to put in a few additional pieces–so it is off center and the strips don’t match but I think that adds to the character of the piece. I had three pieces left–enough to make a nice label. Now to figure out what to put on the back—and it will be ready to add to the ‘to be quilted’ pile. And another UFO is off my shelves—I don’t really count ones that need to be quilted as UFO’s.